In the year 2112, the Earth has been invaded by Evil Forces. A lone motorcycle-riding vigilante stands against the invaders as he travels from city to city, searching for survivors. You must travel along the twisting roads and reach the goal within the time limit. 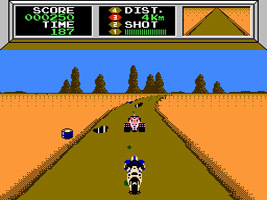 Mach Rider can shoot the Evil Forces off the roads, or push them off the road by ramming them from the side. Stages are also littered with oil slicks, puddles and ice patches that cause you to slip, and Oil Drums that must be avoided. Each course has two routes you choose at the start of each stage.